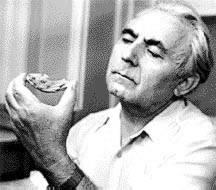 Mammadali Huseinov, Azerbaijani archeologist with the jawbone of a prehistoric "Azikh Woman" which he discovered in 1968. It has been confirmed to be 350 to 400 thousand years old. In 1968, Azerbaijani paleontologist, Mammadali Huseinov, (1922-1994) discovered a lower jawbone of Early Man which turned out to be one of the Neanderthal type. It has since been analyzed independently in the West and confirmed to be between 350,000-400,000 years old. The jawbone, with one molar totally intact and another partially broken, is believed to have belonged to a female about 18 years old. (In those days, she would have been considered "old" as the average life span is believed to have been about 20-22 years). In the cave where the jawbone was found-Azikh Cave-tools chipped and carved out of stone were found dating back to the Paleolithic and Mesolithic periods which would make them between 1-1.5 million years old. 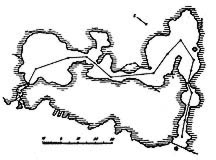 Plan of Azikh Cave which is about 8,000 square meters and contains maze-like passageways that extend nearly 600 meters through eight large hallways or grottos. According to the French paleontologist, Lumlee, the Azikh jawbone is the fourth oldest human relic ever to be found in history. The first was discovered by Richard Leakey (his wife, Mary, and son) in Olduvai Gorge, Tanzania. The second, in Kenya; and the third, in France. Huseinov's discovery is the oldest ever identified in the entire former Soviet Union. "Azikh Man"-one of the earliest inhabitants on earth once populated the region now known as Azerbaijan. It's one of Azerbaijan's best-kept secrets. Not many people outside of Azerbaijan or the former Soviet Union know about it. Huseinov named these prehistoric people, "Azikh Anthropos", because they inhabited the cave known as Azikh Cave near the Azikh River on the southeastern slope of the Little Caucasus mountain range in southwestern Azerbaijan. The cave is close to the Iranian border near the town of Fuzuli. Currently, the region is under military occupation by Armenians. All Azerbaijanis have fled the area since 1993 (See Side Bar: "Want to Visit Azikh Cave?"). One of Huseinov's greatest disappointments in life was that since the late 1980s, he was not able to continue his research in the Azikh Cave because of the military threats and war in the region. Until his last days he had not lost hope that the region would be liberated from Armenian occupation. He died in 1994 at the age of 72, his dreams still not realized. 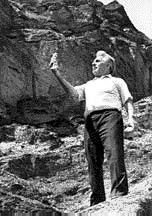 Mammadali Huseinov, archeologist, in front of Azikh Cave considered to be the earliest cave ever inhabited in the region of the former Soviet Union. 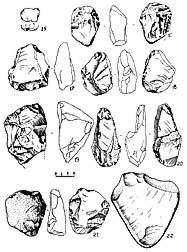 Stone tools date back to 1.5 million years to 730,000 years ago. One of the reasons the international community doesn't know much about "Azikh Man," is that Huseinov didn't get a chance to travel abroad much. He was not a member of the Communist Party; furthermore, he had been captured by the Germans during World War II and, incredible as it may seem, prisoners of war were treated with suspicion after they were released. Many of them, in fact, were exiled to Siberia. Foreigners rarely got the chance to visit or collaborate with him about his work. He did manage, however, to develop a fairly close relationship with the French scientist, Lumlee. Huseinov relied on information he read in Russian journals and magazines to stay informed about developments in the field. Huseinov was the first archeologist ever to discover Paleolithic relics in Azerbaijan. Before him, no one imagined that Paleolithic man (also known as Stone Age Man) had lived in the Transcaucasus two million years earlier. Huseinov's work as an archeologist was successful from the beginning. In 1953, as a university graduate, he organized an expedition into the Kazakh region in the northwestern tip of Azerbaijan near Armenia and Georgia. He found many artifacts spanning the Aeneolithic (5,000-4,000 BC) to the Bronze Age (3,000-2,000 BC) in the region. Interior of Azikh Cave in the Southwestern part of Azerbaijan. The cave is believed to have been inhabited as early as one million years ago. The cave contains fourteen meters of cultural deposits relating to different periods of mid-Paleolithic period. It was discovered in 1968 by Mammadali Huseinov. But it was Azikh Cave that Huseinov called his "masterpiece". His discovery came in 1960. 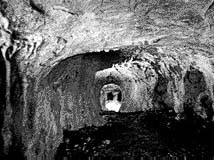 People of the Karabakh region nearby knew about the cave. Many legends were told about how it was a dangerous place-inhabited by dragons. Those who entered were not expected to come out alive. One tale that was widespread described how a flock of sheep had wandered inside the cave and been eaten alive by dragons. Azikh is quite sizable. It is the largest limestone cave ever found in the Caucasus and extends through maze-like passageways for nearly 600 meters. The cave comprises a total area of about 8,000 square meters and includes eight large hallways or grottos, some with very high domed ceilings reaching up to 20-25 meters. Stalactite and stalagmite columns can be found throughout the cavern. Huseinov concluded that Azikh Cave had been inhabited over a period of, perhaps, tens of thousands of years, as there were fourteen meters of cultural deposits (archaeological debris) that comprised ten distinct archeological layers relating to different periods of mid-Paleolithic period in the cave. One of Huseinov's unique findings was the primitive work stones, which in archeological terms, represent a river stone culture. He called that period the Kuruchai Culture as the Azikh Cave is located in the Kuruchai River basin. The only other known civilization equivalent to Kuruchai Culture dates back 1.5 million years to the Olduvai Gorge in Tanzania. Huseinov believed the Kuruchai Culture dated from between 1.5 million years to 730,000 years ago. As is true of many cave settlements, bones of various animals were found; 45 distinct species have been identified, some of which are now extinct. After fire was introduced, it seems that most animal bones were burned. From all indications cave bears and various species of deer were the pride of the hunt. The cave bear seemed to have religious significance for the Azikh people. A hiding place was discovered in the Acheulian layer near the hearths where skulls of the bears were laid out. All the skulls had been severed in a similar way. Both the upper and lower jaws were missing. In one case, two jawbones cut in halves formed a cross. In another case, a cross was repeated graphically, and in another, a crossed notch was found among other notches on one of the skulls. No such phenomena had ever been known for other relics of this period. One of the most important findings in the 4th stratum dealt with the history of making fire. Under the influence of hunting, people began to make artificial hearths by digging pits in the ground and encircling them with masonry or semicircular bars. The area designated to hold the fire is rather shallow and seems to have been used not only for cooking meat but also for preserving fire artificially. Such a finding would indicate serious changes had taken place in the life of these ancient peoples, separating them from other living beings. This was the last discovery that Huseinov made in relation to Azikh cave. Between 1972-73, five fireplaces were discovered in different stratigraphic levels. One was surrounded by a crescent-like stone wall foundation 30 centimeters thick. This wall was built to protect the living area from sparks. It is the first known construction in the history of humankind and first known fire place. It most probably dates to the period 700,000-500,000 years ago. Of particular interest is the fact that the hearths exist during different periods on the same site, important evidence for the continuity of traditions. A rather strange phenomenon was discovered in the 4th stratum (Acheulian period). In this layer, no evidence of human life was found. For some reason, it seems the inhabitants left the cave only to return to dwell there later on. The question, of course, is why. This phenomenon is evidenced in other caves, as well. Could it have been that an upper section of the cave had collapsed and people were afraid to enter? Or had an accident occurred? Some archeologists suggest that after the Ice Age, the climate became warmer and people no longer needed to stay inside; as they could live more openly in settlements. Huseinov's work was never recognized or given any state or national prize. He loved his work and didn't expect external awards. His students deeply admired and respected him. It is his dedicated research , however, that has proved beyond a doubt that the area now known as Azerbaijan was one of the earliest known cradles of civilization. Arif Mustafayev is Professor of Archeology at Baku State University. He worked with Mohammadali Huseinov in the Academy of Sciences for 25 years. Want to Visit Azikh Cave? Want to visit Azikh Cave-prehistoric home of "Azikh Anthropos" who lived at least 300,000-350,000 years ago? You'll have to wait awhile. These days it's impossible. Azikh cave is located in southwestern Azerbaijan close to the Iranian border near the town, Fuzuli, in the Kuruchai Valley on the southeastern slope of the Little Caucasus mountains. It's in a region which was captured in 1993 by Armenians and which is being held militarily. Currently, 20 percent of Azerbaijan's territory in the western part of the country has been captured by Armenian forces. The occupied territory includes Nagorno-Karabakh, a mountainous enclave inside Azerbaijan which Armenians are trying to develop as an independent Republic, as well as much of the surrounding territory. The Nagorno Karabakh Conflict began in 1988. There has been a cease-fire for the past two years, but up until then, thousands of Azerbaijanis and Armenians have been killed in a war that has been fought entirely on Azerbaijani soil. More than one million Azerbaijanis have since fled and evacuated the occupied regions. Displaced in their own homeland, many of them are trying to survive in improvised shelters and "tent camps" that have been set up by humanitarian agencies as close to their original communities as is possible. Azerbaijanis are hopeful that a peace agreement will be signed soon that will give them the right to return to regions inside their own country and rebuild their communities and their broken lives. When the peace comes, then visits to Azikh Cave will be possible-if landmines haven't been scattered throughout the region.